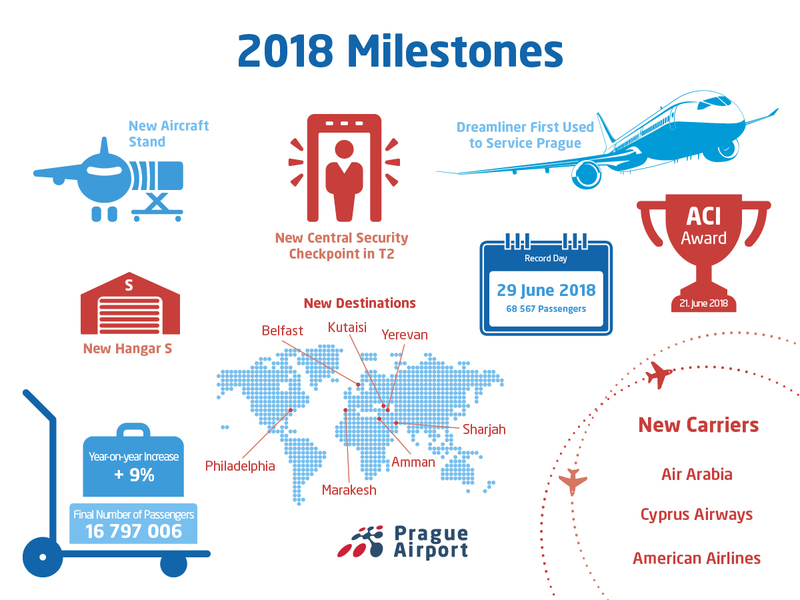 2018 Brings More Passengers and More Destinations to Prague Airport. Václav Havel Airport Prague has continued to grow without interruption since 2013. In 2018, as per the latest operating results, Prague Airport handled a total of16,797,006 passengers, which represents a 9% year-on-year growth. Routes to Great Britain were the busiest last year with the greatest number of passengers traditionally heading to London. Barcelona recorded the highest year-on-year increase in the number of handled passengers on the route. Long-haul routes also significantly enhanced their performance, with nearly quarter of a million more passengers compared to the previous year. “Last year meant additional growth in both the number of handled passengers and regular scheduled routes at Prague Airport. Three new air carriers launched their operations in 2018 and there were seven new destinations put on the map of connections from Prague. We were able to significantly enhance the long-haul segment by increasing both the number of frequencies and capacity, and by launching brand new routes. As a result, over 250 thousand more passengers used long-haul connections with Prague, representing a 24% increase,”Vaclav Rehor, Chairman of the Prague Airport Board of Directors, said.